It's tricky planning an outdoorsy party in the middle of Winter, you have to be a bit clever to defeat whatever the elements might throw at you. 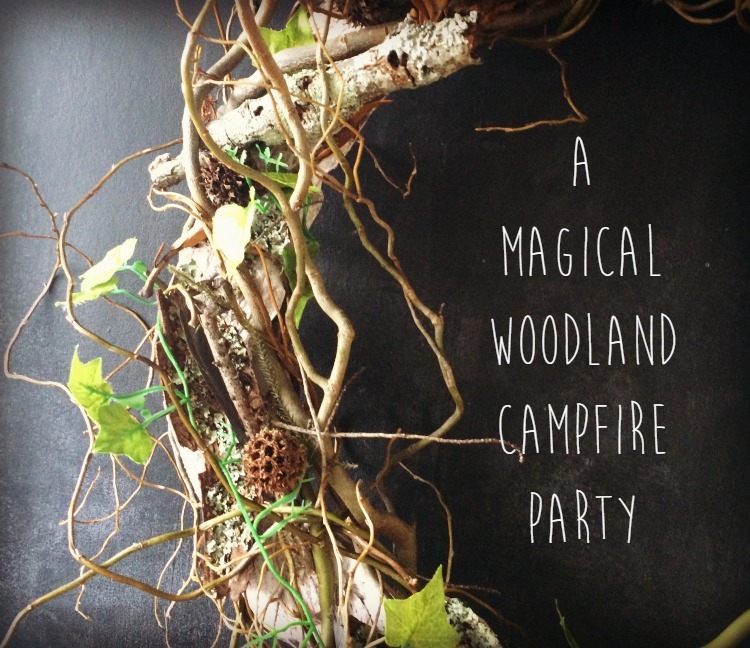 I knew right from the beginning that we'd have our party under the covered grapevine, campfire and all. We've done it before, after all. I figured that, short of a thunderstorm, we could make it pretty cosy and warm under the shelter, mixing the desire for a fire outdoors with an all-but-guaranteed weather-proof location. We lit the fire in a metal tub, propped up on a giant stump of a log that had been conveniently foraged from the side of the road (when a neighbour cut a tree down). Hessian coffee sacks from parties-past were strung up to give a sense of rustic cosiness and help break any wind/rain that might try and come to spoil the fun. The main food table was my home-made wooden trestle table, made long ago from ripped-up old decking, and still going strong. Yes, folks, I hammered that one together myself. I gave it a quick once-over with some white paint to freshen it up, after I finished painting the woodland trees backdrop, on a bit of old ply that had been mouldering at the side of the house. To say I was pleased with how it turned out would be an understatement. I made the feather garland by stitching white craft feathers (from the $2 shop) onto white biased binding. 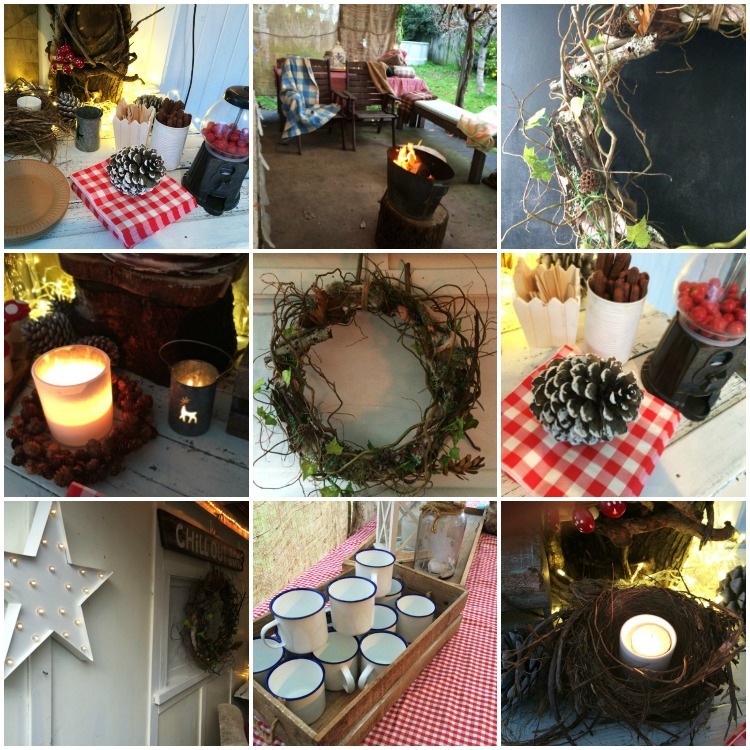 I accessorised with foraged pinecones, logs, a birds nest and candles of all shapes and sizes, plus rustic crates and wood rounds from the Pop Roc Parties hire collection. I strung up photos of the girls which I'd printed out Instax-style and pegged up on twine to create a photo-board of the birthday girls when they were younger. They've been friends for a really long time! I made the wreath with the help of our lovely local florist, which generously donated the MDF base; she had already twisted willow around it for me, and all Mel and I had to do was weave in greenery and other bits we had collected on our woodland foraging expedition months earlier. The possibilities for woodland themed food that we found on Pinterest were endless, truly, but we limited ourselves to simple and effective. setting up a dessert/treat table that the guests could snack from throughout the night (our party ran from 5pm-9pm). .... and toadstools - simple vanilla cupcakes in white baking cups from KiwiCakes, frosted with red buttercream and decorated with white fondant dots. I'd seen mini marshmallow Smore Pops on Pinterest, and simply had to do them. Simply being the word - we left the birthday girls to create our version of them in the half hour before the party started. Marshmallows, on a toothpick, dipped in melted chocolate then into biscuit crumbs. Yummy! The food looked spectacular set up on the wood rounds (from Pop Roc Parties hire collection). The toffee apples were made by my clever mum, who had done these once before for us at Scrag's Carnival Party. These ones turned out even better - so cute and shiny-red, in their little gingham cupcake papers from Kiwicakes. As you can imagine, they were super popular with the guests! Also super-popular were these cute (and very simple) Wild Berry parfaits, served in mini mason jars from Pop Roc Parties' Hire Collection. They were simply crumbled up chocolate cake, with a scattering of frozen blueberries, a layer of chocolate instant pudding topped with crumbled choclolate flake bar on top. Just the perfect size for a party dessert! I love these little woodgrain baking cups, from Kiwicakes. We used them to put popcorn in; they were the perfect size, being slightly larger than standard baking cups. 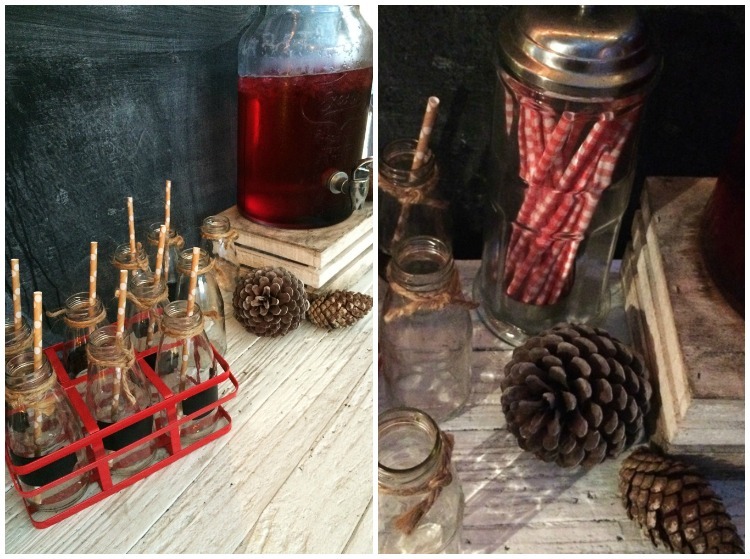 To drink, we served berry fizz from my drinks dispenser (fizzy lemonade with a splash of blackcurrent syrup), in mini milk bottles, with jute twine tied around the top (Kraft dotty straws from Pop Roc Parties; gingham paper straws from KiwiCakes). Abby and Em, the birthday girls. Now twelve years old. 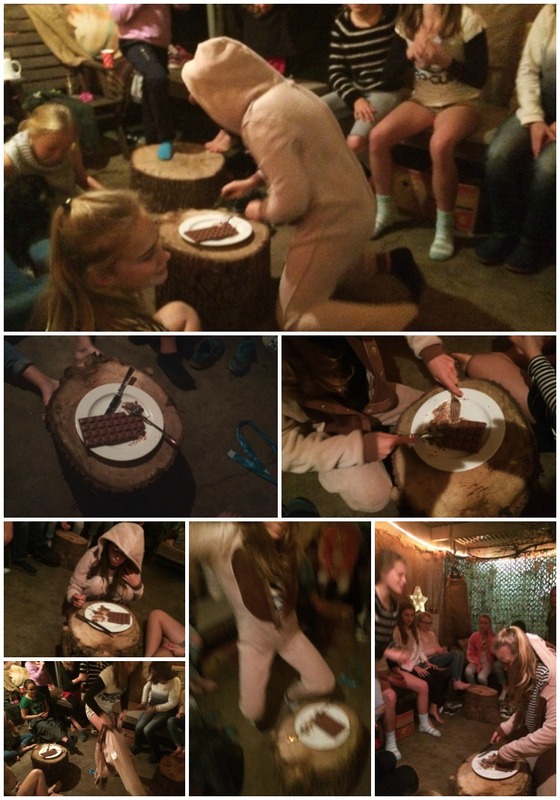 When you have a bunch of energetic, fun-loving 12-year old girls in a magical setting, with a campfire, you don't really need to provide a lot of structured entertainment. 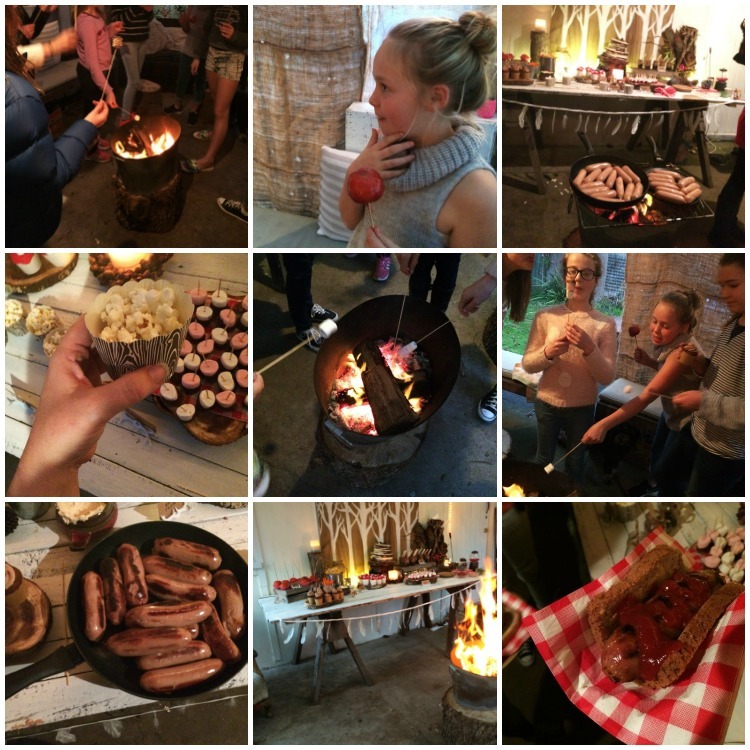 We had a whole bunch of potential campfire games up our sleeve just in case things needed a boost e.g. spin the bottle/truth or dare, circles and triangles and of course THE CHOCOLATE GAME. If somebody else rolls a six, they have to get the onesie off the person who is wearing it, get it on as quick as they can and start eating chocolate with the knife and fork, until somebody else rolls a six. Somebody might roll a six before the first person even gets the onesie on. Too bad. What I love about girls this age is that they really don't need us grown ups to show them how to have a good time. They are a party waiting to happen, all on their own. This cake was a combined effort between myself, my kitchen hand cake layer bakers (aka Miss fab and her pal Ruby), KiwiCakes (who supplied all the decorating goodies) and My Little Bakery who came to my rescue with a batch of vanilla buttercream, when my plan for white chocolate ganache turned yellow. (Yep, forget trying to be fancy and make white chocolate ganache if you want whiteness. It's notoriously yellow. not many people know that. But now you do). The pinecones are made from fondant, as are the ivy leaves. These were so simple to do, they were actually created by 12 year olds! Ahhh yes, as always, the key to a gorgeous cake is not being a professional cake decorator, it's having the right equipment. Ahhhhhh. It was just so pretty. So magical. 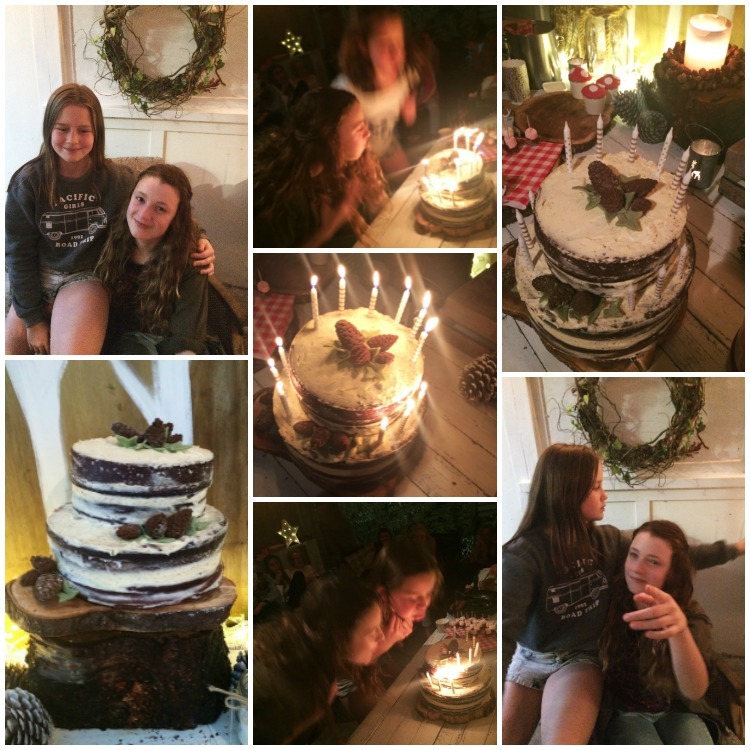 Happy birthday dear Abby & Em! Happy 12th birthday! We sent our guests home with a cute little token of our appreciation, a feather pendant all packaged up cutely (chains and metal feathers sourced from Ali Express of course). 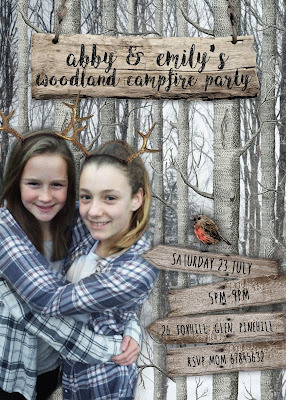 A MASSIVE thanks goes out to these two wonderful friends who helped me pull off this party. 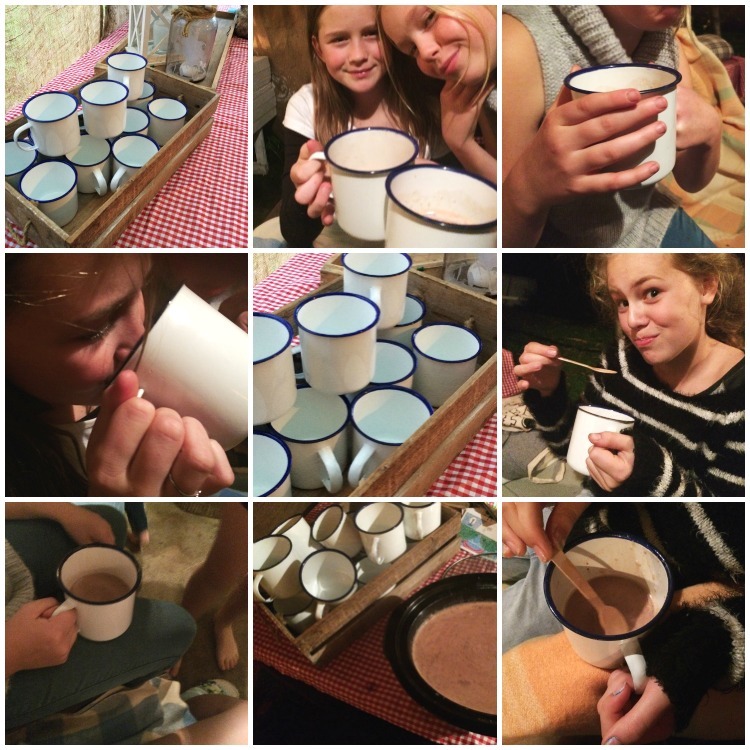 They worked like trojans, lighting (and tending) fires, prepping food, sizzling sausies, making hot chocolate, doing endless dishes and helping clean up and pack away after all the fun was over. Mel and Nic, you guys made this party possible! Thank you for being so flippin awesome.